Funny thing the British weather last month a swamp this month only 16mm of rain causing a turnaround in fortune and here at the end of the month if we hadn’t silaged we would be looking at having a shortage of cattle grazing. This month we are joined by Daniel from Middlewich School on a two day a week, works experience placement until the end of the summer term in July. Daniel is also attending Reaseheath agricultural collage and hopes to take up full time farmwork on finishing school. The patch of oats we didn’t sow has been re-seeded with grass seed which is now not growing due to the dry conditions. 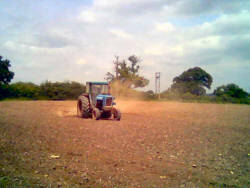 Here I am preparing the ground with the dutch harrows as you see in a cloud of dust. We have had four calves all Angus bulls and all doing well. Dorothy, Graham and Andrew in the schools out marquee and Margot with the YFC. 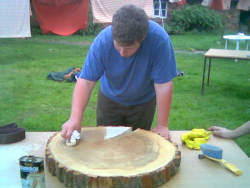 Click here for more and to learn just why Simon is spending time sanding this piece of wood. Show over and straight away out with the roadshow at the Wimboldsley school summer fair. 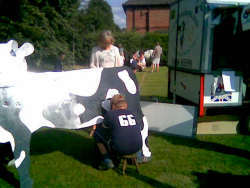 Here is Jacob milking our cow watched by mum Stella. 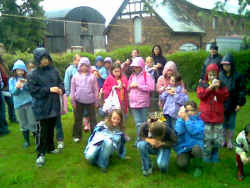 Monday and it’s the turn of Congleton brownies on about the only damp evening of the month. Here they are with the ducks and chicks we brought home from the show after an evening’s pond dipping and hedgerow study. All towards an environmental badge so their Brown Owl tells me. The end of the month saw Simon and I off to Old Trafford to watch the England vs Sri Lanka one day cricket in a close fought match with over 600 runs scored the visitors triumphed. Ahh well so long as we retain the ashes this winter in Australia we can afford the odd hiccup.